Caring for the surviving spouse of a veteran requires special considerations. This is especially true on military holidays when this elderly adult may be dealing with emotions and challenges that are more intense and marked at these times than at other times of the year. Taking the time to honor this surviving spouse and show your appreciation for the service that their partner gave, but also for the sacrifice and courage of the spouse, creates a meaningful experience for both the senior and you. This can help make this difficult time easier and create memories that you will cherish well into the future. Acknowledge it. Though thinking of their spouse may be difficult, especially if the loss is fairly recent, it is often more painful for them to feel as though their partner has simply been forgotten. Make sure that you acknowledge the holiday and the veteran both leading up to the holiday and on the holiday itself. Create a meaningful gift. Offer your elderly loved one a gift that is meaningful and allows them to keep reminders of their partner close by at all times. A simple shadowbox that contains the flag presented during their funeral, any medals or insignia that they have, and even a piece of their uniform such as a hat is a beautiful and moving tribute that your parent can put on display in their home. Not only does this create a touching and attractive display for the home, but it also helps to protect these precious items for the future. Make a visit. Military holidays are an ideal time for your aging parent to make a visit to the grave of their veteran spouse. 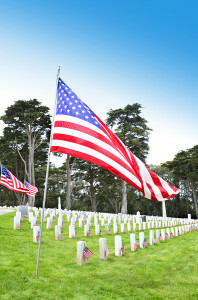 Depending on the regulations of the cemetery your aging parent may want to decorate the grave with a small flag or a floral arrangement that includes a patriotic ribbon or other detail. Encourage them to wear something that designates them as a surviving spouse so that those who see them during their visit will be able to voice their appreciation for everything that your parent and their veteran spouse did. This is also a meaningful time for your parent to tell your children about their experiences and what their other grandparent did, ensuring that the memory of their partner will carry through the generations. An elderly care provider can be a meaningful addition to a care routine for a senior who has recently lost a spouse. This elderly home care services provider can be there for your loved one to offer companionship, support, and encouragement as they adjust to this new chapter in their life, as well as when they face new challenges such as military holidays that may remind them of their spouse. Through this personalized approach to care the elderly care provider can help your parent to work through their emotions, feel less alone and isolated, and experience a more engaged and involved lifestyle that promotes better health and wellbeing. If you or an aging loved one are considering Elderly Care in East Windsor NJ, please contact the caring staff at Alpine Home Care. In PA call 888-743-0068. In NJ call (855) 410-1404.